Everything HG Wells should have written. - because it was too fantastic. In the year 1870, American inventor Thomas Edison paved the way to the stars! He reached Mars with the prototype of an ether flyer and was the first man to set foot on the red sand of a foreign world. He was the first of many to come who would gaze in astonishment at the wonders of Mars and its inhabitants - the canals of the Red Planet, built many millennia ago; cities that were already old when on Earth, the Sumerians stacked clay bricks to build the first settlements; and relics of old technologies the functionality of which has long been forgotten. Numerous other explorers have followed in Edison's footsteps, not only reaching the Red Planet, but pushing forward to the other planets. The misty swamps, seas, and jungles of Venus offer fantastic raw materials and bizarre creatures - most of them dinosaurs. Plantations and settlements are built at great expense, defying all adversities. Mercury to has many precious resources to offer, and it too is inhabited by primeval life forms in the twilight zones between a hot and cold side, daring explorers will find the foundation of their future fame and fortune. But adventure can also be found in remote uncharted areas of on earth and the colonial powers struggle for power and influence can be just as exiting as stunning inventions or encounters with famous people. 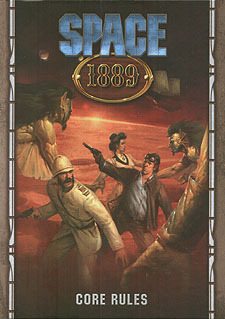 Space 1889 is a science fiction roleplaying game set in a more civilized time. A time when gentlemen and ladies of good character discover that there are adventures to be found in London's fogbound allies just as much as there are on the dusty streets of Sytris Major on Mars. A time when soldiers might be posted to East Africa or Mars by order of their country; a time when inventors rush to test their latest designs and their latest theories; a time when historians search for the secrets of the ancient Martians; and when wild Venusian Lizard-men and proud Martian steppe warriors must serve their tribes and seek fame and fortune in a time when aliens from Earth have come to their planets. At the core of this roleplaying system are the innovative, easy to learn Ubiquity rules that emphasize storytelling and cinematic action. Space: 1889 - Four worlds full of new adventures.